We Americans write our own history. And the chapters of which we’re proudest are the ones where we had the courage to change. Time and again, Americans have seen the need for change, and have taken the initiative to bring that change to life. I’ve chosen not to challenge the rule of law, because in our system there really is no intermediate step between a Supreme Court decision and violent revolution. When the Supreme Court makes a decision, no matter how strongly one disagrees with it, one faces a choice — are we, in John Adams’ phrase, a nation of laws, or is it a contest made on raw power? Albert Arnold “Al” Gore, Jr. (born March 31, 1948) is an American politician, advocate and philanthropist, who served as the 45th Vice President of the United States (1993–2001), under President Bill Clinton. He was the Democratic Party’s nominee for President and lost the 2000 U.S. presidential election despite winning the popular vote. 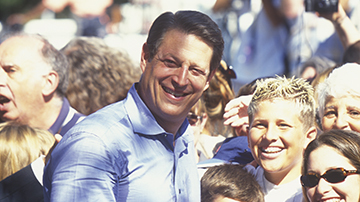 Gore is currently an author and environmental activist. He has founded a number of non-profit organizations, including the Alliance for Climate Protection, and has received a Nobel Peace Prize for his work in climate change activism.